Mrs. Hall was no push over. She was a tall, impressive figure with graying hair framing her stern face. Her wardrobe was sensible and well-pressed; suits or dresses with matching cardigans and shiny, low-heeled, patent leather pumps that reflected the overhead florescent lights. She was a no-nonsense professional and expectations were high. Fourth grade was serious business. There was no room for warm and fuzzy in Mrs. Hall’s lesson plans, no sugar-coating or undue praise. But she was fair. If you did a good job, you got a good grade. She didn’t play favorites, but even if she did I would not likely have been one. My papers never lacked red corrections, and the dog ate my homework more than a couple of times. Mrs. Hall read books aloud to our class. Every single day. After lunch, we would sit in our chairs, heads resting on crossed arms. Mrs. Hall’s voice softened as she explored new worlds with us. Her melodic tone relaxed me. Sometimes I closed my eyes and it was as if she were reading only to me – a private story telling. I felt cozy, comforted and cared for by crusty Mrs. Hall. She read classics like The Island of the Blue Dolphins and Mrs. Piggle Wiggle. My very favorite book was called Twig. It was about a little girl who was as small as a fairy and lived in a tomato can. I loved Twig and all her adventures. I imagined myself right alongside Twig, living inside of a tomato can, collecting treasures from the yard. Years later, I still remembered details from the book, like the bottle top Twig used to make a table for her tin can house, and the Elf who became her friend. Occasionally, I’d ask a friend if they knew of the book. No one did. 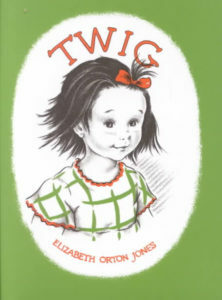 I looked in bookstores, and later online and never found a book called Twig. Part of me was a little relieved – I’d heard it’s not wise to revisit childhood favorites with an adult sensibility. The plots don’t hold up, the characters lack dimension, the settings lose their magic. I didn’t want anything to ruin my enchanted memory of Twig. I even wondered if Twig was real or something I’d conjured up about a beloved teacher. Recently, in the middle of a sleepless night, I pulled out my phone and plugged TWIG into my search engine. The book cover popped up and Twig’s little face stared back at me from my phone. It was as if she was saying “Where have you been, friend?” It turns out Twig, written by Elizabeth Orton Jones, originally released in 1932 was republished in 2010 by Purple House Press, a publisher whose “mission is to rescue long lost, but well loved children’s books.” There were dozens of reviews for the book – other readers sharing childhood memories of a much beloved story. I clicked “order now” without checking the price. As soon as Twig arrived, I curled up in a chair and cracked open the cover. From page one, I was taken back to a magical time in my life. I was once again a little ten-year-old girl. I heard Mrs. Hall’s voice in my head, slow and steady, reading each line like a poem. It felt like a long-awaited reunion. I don’t remember much of what I learned in 4th grade but I will never forget the experience of being read to, and the way it felt to be immersed in a story. I have no doubt that Mrs. Hall influenced my love of reading and writing. Mrs. Hall didn’t tell us reading was important, she showed us the power of books. And I will be forever grateful. Thank you, Mrs. Hall. Thank you for sharing this! You perfectly described the feeling of a story capturing a child’s heart and how that never goes away. Thank you so much, Cindy! I love this tribute to the everlasting impact that reading a book aloud has to a child. Thanks for sharing, Barbara.